Wasting energy on the trivial, frozen in crisis, restricted, confused, feeling powerless, trapped by circumstances. The Brambles Crone lives among the blackberry hedges where the fruit is tempting and sweet, but even the leaves have wickedly curved thorns to catch and hold. 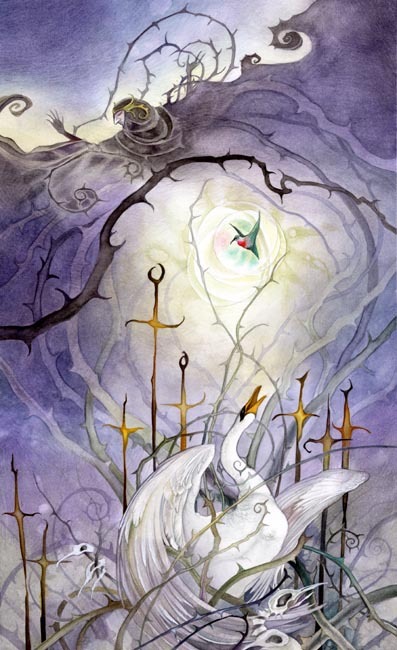 The little hummingbird may flit and navigate with ease among such treacherous tangles, but the noble and grand elegance of the Swan with the arcing spread of her wings is not for such tangled and thorny corridors.